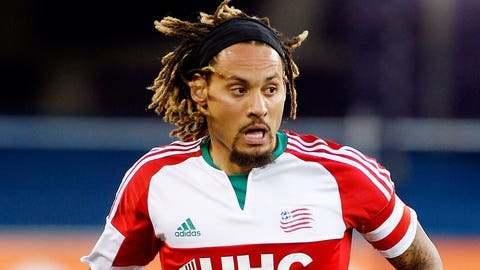 New England Revolution midfielder Jermaine Jones said he has received offers from Europe and Brazil as he weighs his future. Jones' contract with the Revs and MLS is set to expire at the end of the year. New England midfielder Jermaine Jones revealed he has received offers from Europe and Brazil with his Revolution and MLS contract set to expire at the end of the year. Jones’ 18-month contract concludes in two months. He expects to sort through opportunities during that period with the goal of securing a long-term deal through the 2018 World Cup. The key for Jones at this point: figuring out a solution to carry him through the remainder of his career and place him in the best possible position to stay in the United States national team picture. Jones said he spoke with U.S. coach Jurgen Klinsmann about his desire to remain with the program for as long as possible. The combative midfielder turns 34 on Tuesday, but he still harbors hopes of playing his part on the international scene through the trip to Russia. I am so thankful what has happened in one and a half years with the club, the teammates & fans, the city of Boston! I appreciate the love from everybody! I'm going home now and finally enjoying my family! Very excited to see what will be the next step in our life! Whether those priorities dovetail with the Revolution’s willingness to retain him remains uncertain. Jones played a key role in New England’s run to MLS Cup in 2014, but he struggled with a hernia complaint for the first half of this year and turned out just 18 times for the Revs in league play. Jones’ contract paid him a reported $3 million in guaranteed compensation for the 2015 season, according to MLS Players Union documents. It is unknown at this point whether the Revs are prepared to offer Jones a similar level of compensation or provide the requested term after agreeing to a short-term, guaranteed deal in the wake of Jones’ performance at the World Cup last year. Jones’ physical confrontation with referee Mark Geiger in the Knockout Round defeat at D.C. United and his expected suspension at the start of next season further complicates the calculus between the two sides. New England must weigh those questions and other squad-related issues in the coming weeks. There are a handful of pressing concerns on the table — including a potential dialogue with playmaker Lee Nguyen after he expressed displeasure with his current deal earlier this year — and the desire to strengthen the team after the early playoff exit. Jones posted a heartfelt message about his time with the Revolution on his Instagram account on Friday, but he said he understood the Revs needed to work out their own plans before addressing his future. Jones praised the club, the league and Revolution investor/operators Robert and Jonathan Kraft for his spell in MLS, but he also underscored the need to weigh the financial and the personal ramifications of a new contract as he sorts out his future. For now, Jones plans to spend the next few days in southern California, take a few days off and then train earnestly ahead of the World Cup qualifiers against St. Vincent and the Grenadines and Trinidad & Tobago next month.